I’m super excited to share with you my mini haul from this years Bournemouth Vegan Fair, which includes some lovely cruelty-free items that are already firm staples in my toiletry cupboard… and my travel bag! For those of you unfamiliar with the fair, Dorset Vegan bought together an amazing selection of brands and companies all under the (massive) roof of the BIC, ranging from cosmetics, clothing, food and even virtual reality devices. This has grown from last years event, which was housed at the Pavilion (you can read my review of it here) and was clearly a huge success, which was repeated again this time around. Although we visited on the second day on a Sunday at about 1pm, the hall was still packed with eager veggies and vegans alike looking for some ethical goodies. Here’s a selection of a few of the things that made their way into my canvas tote bag! 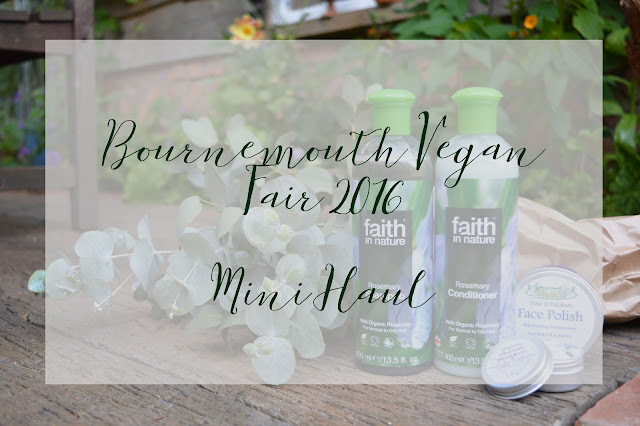 When I stumbled across Little Green Steps’ stand, I was immediately drawn to the huge amount of shampoos, conditioners and shower gels from Faith in Nature on offer. I’d never heard of the brand before, but had been looking for a natural alternative to my usual hair washing products after worrying about the effects that the chemicals have on not only my hair, but my wellbeing in general. It did prove tricky to choose what pairing to go for though as there were so many lovely scents to choose from! I originally wanted lavender, but couldn't find an accompanying shampoo to the conditioner I found, so instead opted for the equally as divine rosemary. I’ve since been recommended the chocolate combination, which is definitely on my list for next time! Is it weird to say that I can’t wait to wash my hair now? Heavenly Organics have been on my cruelty-free “to do” list for quite some time after coming across them last year and, even though I’d told myself that I would save buying anything until the end of my circuit around the stalls, I ended up buying their Lavender Hand Balm without giving it a second thought. It smelt amazing and is perfect for giving my hands some much needed TLC! I used it straight away and it hasn’t left my handbag since. Not only does it make my hands super soft, but the smell is a calming comfort to me wherever I go. I’ve always been a fan of Hollistix since including their Gardener’s Rescue Hand Balm for my Oh Comely Perfect Strangers project box last year and was glad to bump into them again! Not only did their stall look amazing with a wooden shelving unit full of gorgeous looking (and smelling) lotions and potions, but their lovely stall owner was lovely to chat to, offering some great advice on what product would best suit me. I went for their Face Polish, containing frankincense, coconut oil and myrrh, which will be great for the upcoming summer months (which I hope will make an appearance soon) when I dare to go barefaced and au natural! Kieran was particularly taken with the natural beard products from Good Day Ogranics, as he's always on the lookout for something new to try, as well as these amazing flavoured chocolates from Ethicoco. The Chai Latte combination tasted incredible… and of course a bar made its way home with us. It didn’t last long! I also had more than my fair share of Pana Chocolate’s samples, which I originally tasted in Stockholm’s Doctor Salad cafe last year… so was pleased to see them make an appearance in my hometown! We’ve since made sure to keep our supply fully stocked from Sunrise Organics, located near The Triangle in Bournemouth. We also both gave iAnimal's virtual reality video a go, which puts viewers in the position of a pig in a slaughterhouse. I didn’t get too far in before sensing that I would find it too upsetting, with Kieran confirming my suspicions when I overheard him telling the stall owner “I don’t think she should watch the rest!” Whilst it’s no doubt an innovative way of showing the world the horrors of what goes on behind closed doors and will prove beneficial in raising much needed awareness, I don’t think it’s for me. I’m glad I gave it a go (briefly!) though. All in all, I was so impressed with this years Vegan Fair but, judging from last year, I knew it wouldn’t disappoint! I’ll give my lovely new goodies a try and keep you updated on my thoughts. Let me know if you attended and what your favourite stalls were!